If we want to make optimal use of Open Data -- also in the frame of the Sustanaible Development Goals (SDGs) -- we need to know what is exactly Open Data, what SDG-target(s) they can be used for, what regulations they are aligned for, who is working on what? This essay lists several sources that may facilitate addressing these issues, as well as planning for Open Data as part of a wider strategic planning process, covering all stages from data production to dissemination and management of statistical assets. "Open data is digital data that is made available with the technical and legal characteristics necessary for it to be freely used, reused, and redistributed by anyone, anytime, anywhere", - Open Data Charter. "Open Data can help ensure that plans to achieve the SDGs are evidence-based, and that their outcomes are measurable. The SDGs are being launched with an emphasis on collecting data that will be extensive and specific enough to serve these needs...Open Data can help assess the SDGs in three main ways. It is a facilitator of standards, a tool for accountability and an evidence base for impact assessment", - Sustainable Development Goals and Open Data, The World Bank. "Impact can be increased when we can build on results of other organisations. However, we don’t know always the exact activities, objectives and results (outputs/outcomes) of the various parties in a given geographical area. This implies that we lose both their results and the potential collaboration force, despite the fact that most of these parties thrive for the same goal or goals", - TRIMPACT. The Open Data community must broaden its engagement in all these issues to address emerging challenges. Adopting the Charter brings a number of benefits to governments. The AgPack suggests 6 policy areas where open data can support the agricultural sector and identifies 14 data categories to realize impact in the agricultural sector. 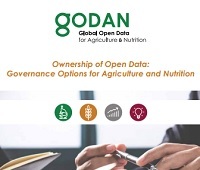 For each data category the potential use of the data by the agricultural sector and the estimated effort to publish this data from government sources are discussed and examples of implementation and initiatives that support the interoperability of each data category are provided. 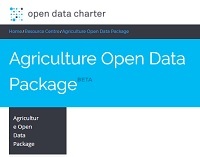 The AgPack also highlights 10 examples of open data in action demonstrating how governments are harnessing data to address sustainable agriculture and food security around the world. Before starting to publish any Open Data, it is important to have a clear strategy in place that defines the key goals and sets the ambition. Key ingredients for a successful Open Data initiative. Creating Value through Open Data. To learn more about what Open Data, see: What is Open Data? (online training module); Practical Guide; Digital Transformation and Open Data (report). 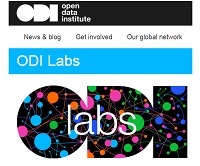 Do you know what Open Data is yourself and about Benefits of Open Data, but want to provide training to your colleagues? Go to the Training Companion that helps you deliver training (see also this relevant Online Training module about Unlocking value from open data). Do you want to learn more about Open Data publication and re-use examples in Europe? There is a specific section in the Library that offers multiple Use Cases. 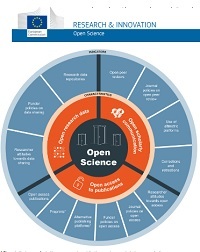 The monitor is a pilot project to test the viability and value of assessing open science activity in Europe and beyond. For the purposes of this monitor, the indicators are based on a distinction between ‘Open Data’ generally and ‘Open Research Data,’ with a focus on the latter. That is, while there are many types of potential Open Data (e.g. government data), the scope is too large for the monitor and difficult to analyse and so we focus specifically on data underlying research publications. ... conducts cutting-edge research on the targeting, coordination and evaluation of development assistance. AidData puts these insights into practice with tools, training and lessons learned to benefit local communities. 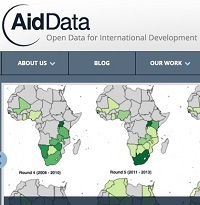 AidData's core 3.0 database includes geocoded data from a variety of country aid information management systems (AIMS), donor IATI feeds, and open data initiatives like the World Bank’s Mapping for Results. Access these data through the AidData GIS Portal, where they can be combined, filtered, and overlaid with other layers of geographic data. 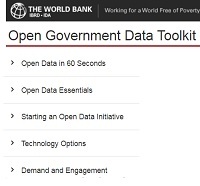 ... is designed to help governments, Bank staff and users understand the basic precepts of Open Data, then get “up to speed” in planning and implementing an open government data program, while avoiding common pitfalls. If you have data in a re-usable electronic form, a publicly accessible online place to put it and an open license, then you’re well on your way. 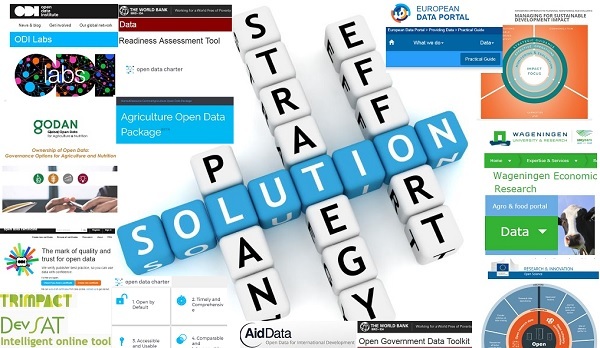 Open Data Readiness Assessment (ODRA) methodological tool can be used to conduct an action-oriented assessment of the readiness of a government or individual agency to evaluate, design and implement an Open Data initiative. As part of the Open Government Data Toolkit, this tool is freely available for others to adapt and use. The chief policy lesson from this paper is that moving to a model where data is open as default requires change in legal, social and technological norms, which all influence ownership of agriculture and nutrition data. Copyrights are not the only, nor even most important, legal rights establishing ownership of data. Relevant legal rights that facilitate access to and use of data at the international, national and subnational level include copyrights, database rights, technical protection measures, trade secrets, and patents and plant breeders’ rights, privacy and even tangible property rights. ... is a free online tool developed and maintained by the ODI, to assess and recognise the sustainable publication of quality open data. It assess the legal, practical, technical and social aspects of publishing open data using best practice guidance. Have a look at this guide to what you need to complete a certificate or start the questionnaire to create your own certificate now. More information on the what, how and why of Open Data Certificates can be found on this FAQ page. ... is dynamic online tool that allows the use to take stock of humanitarian aid, development, research and commercial activities in one or more countries (‘who is doing what, where, when, and how for whom’). Activities are described in detail, linked to the SDGs [and through a linkage - to a Planning, Monitoring and Reporting (PMR) module, Open Data can be stored], and georeferenced at the lowest administrative unit of the specific country. Dashboards help to analyse options for synergy and alignment of stakeholders and to perform gap analyses to plan future actions. For more information about DevSAT, read further at this document [PDF]. For interested organizations and who would like to include their project information in DevSAT, an access code and the DevSAT manual are available. 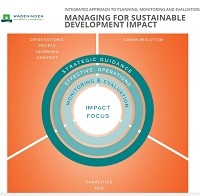 ... is an integrated, results-oriented management approach, which can be used across a range of sectors and domains in a variety of contexts, and aims to contribute towards the Sustainable Development Goals. - responding to change in a complex context.